Jaffer Ladak, 32, a Shia imam. 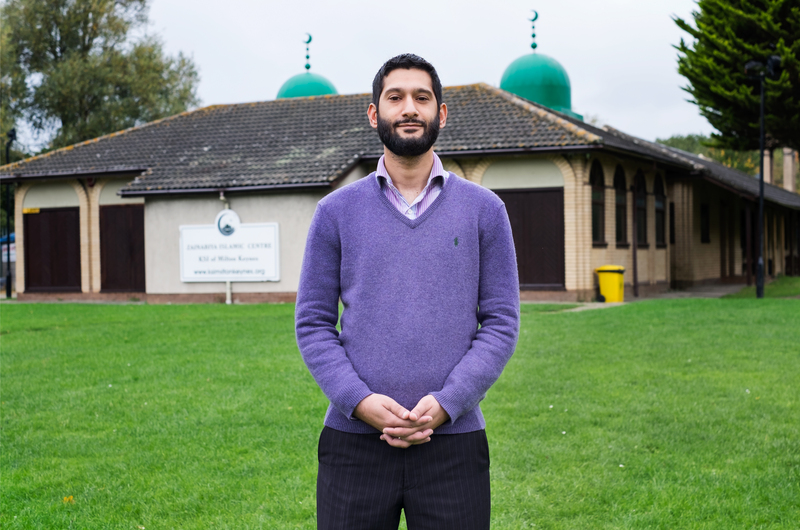 Photographed at the Zenabir Islamic Centre, his local mosque, in Milton Keynes in October 2017. “When I was growing up in Milton Keynes, the typical sermon went: ‘Do this and you’ll go to heaven.’ But all my sermons are socio-political – yesterday I spoke about Labour vs Conservative fiscal policy, and two nights ago I spoke about global warming. I was 16 when 9/11 happened and it had a big impact on me. Suddenly the whole world is looking at you differently. The Muslim community has become more conscious of itself, asking itself: ‘Who are we? What do we stand for?’ That awareness is a positive thing. I was the imam at Hyderi mosque in London for 2014-2016. I’m currently studying at the Al- Qaem seminary in Iraq for nine months of the year, and I still give sermons at this mosque and elsewhere in the UK.